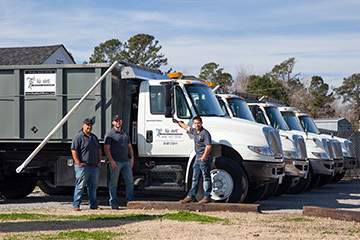 Top Shelf Waste Systems, Inc. is locally owned and operated in North Carolina, serving New Hanover, Brunswick, Pender, Onslow and Horry counties. If you’re starting a residential or commercial construction project or clearing out large amounts of trash, don’t start without calling Top Shelf Waste. Founded in 2010 Top Shelf Waste Systems, Inc. was built on a strong foundation of customer service. It started with one truck and twenty dumpsters. When word got out about our “top shelf” service and reliability, demand from area contractors exploded causing us to increase our inventory to 115 dumpsters and 2 trucks in just 12 months. Today, Top Shelf Waste Systems operates 5 trucks and 300 containers to handle waste management solutions in North Carolina. Our containers were designed with the residential contractor in mind. They are small enough to fit in a single parking spot, allowing plumbers, electricians, utility contractors and any other sub-contractors on site to do their jobs while keeping your project on time and on budget. Unlike our competitors, our open top, roll-off containers are efficiently sized yet hold a substantial amount of debris. These containers are designed to be small enough to fit in a parking spot, allowing builders, plumbers, electricians, or guests to come and do their jobs while keeping your project on time and on budget. Top Shelf Waste Systems, Inc. is honored to offer you best-in-class service for your construction, renovation, cleanup, or day-to-day waste removal. Let us help with your day-to-day commercial waste removal. Call us today for a free estimate! We service Brunswick, New Hanover, Pender, and Onslow Counties in North Carolina and Horry County in South Carolina.